The HL-5370DWT is for small connected workgroups seeking a laser printer with network connectivity and a large, flexible paper input capacity. This printer has all of the features of the HL-5370DW plus it offers increased paper capacity via two 250-sheet capacity paper trays and a 50-sheet capacity multi-purpose tray. Large, flexible paper capacity. Features two 250-sheet capacity paper trays and a 50-sheet capacity multi-purpose tray for greater paper capacity or to simultaneously store letter and legal size paper. Add an optional paper tray for additional capacity. Easily print two-sided documents. Help save paper and produce professional looking two-sided documents, brochures, and booklets using the automatic duplex feature. Fast results. 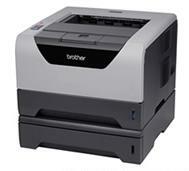 Helps increase your productivity with an up to 32 page per minute print speed. Outstanding print quality. The HL-5370DWT delivers up to 1200 x 1200 dpi resolution so that all of your printed materials look their best.